JNN 01 June 2014 : Dragging your suitcase through the airport or train station could become a thing of the past thanks to this new invention. Now you can even Ride on your Suitcase. 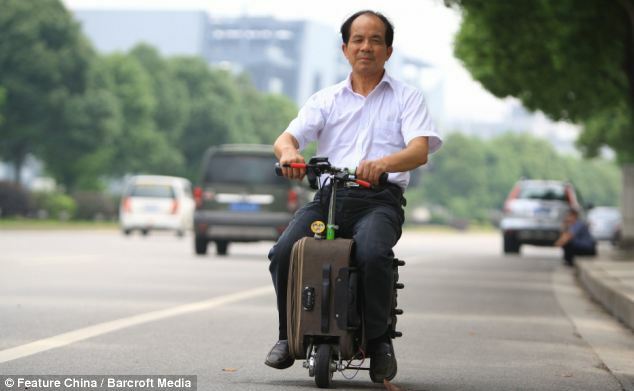 Amateur inventor He Liangcai has created an electric suitcase, which not only transports your belongings, but allows the owner to sit on it and travel along at up to 12 mph. The reinforced suitcase, which weighs 15 pounds, comes with a small battery and is able to carry two adults for a distance of up to 37 miles on a full charge. The piece of luggage consists of an electric scooter, which has a suitcase attached to it. The rider sits on top of the suitcase to reach over to the handlebars where the throttle, brakes and lights can be found. Mr He demonstrated how the baggage worked by riding on one of his suitcases from his home to Changsha train station in China’s central Hunan Province, around seven miles away. According to the Global Times, it took the inventor 10 years to develop the scooter, despite the fact he is a farmer by trade with little formal education. In 1999, he designed a car safety system, which earned him an award in the U.S. And when he forgot his luggage when travelling to America to collect the accolade, he came up with the idea for the suitcase. This entry was posted in Asia Pacific and tagged Bike, Chinese, Suitcase, Suitcase Motor Bike. Bookmark the permalink.